The Dodd-Frank Wall Street Reform and Consumer Protection Act of 2010 designated the Public Company Accounting Oversight Board as the regulatory agency responsible for overseeing the audits of all broker dealers registered with the Securities and Exchange Commission. Over the past 7 years, the PCAOB has performed extensive reviews of audit files, scrutinizing independence, documentation procedures and the general effort put forth by the audit community to ensure the reports issued present an accurate, complete and fair representation of the financial position of each member firm. In instances where the PCAOB has determined that the auditors failed to properly fulfill their responsibilities, fines have been levied and suspensions have been invoked against the audit firms. The severity of failing to establish and execute a near perfect audit program has created a perpetual fear that has pervaded the audit community and has resulted in many small audit firms opting to delist themselves from performing broker dealer audits. For those audit firms who remain actively engaged, the level of due diligence to certify an audit, and the time commitment to ensure they are protected from the PCAOB, has resulted in significant fee increases within the industry. For certain broker dealers, possession of customer funds and their obligation to the investing public, may legitimatize the scrutiny of PCAOB, as the overall objective of this legislation was to restore trust in the financial services sector. For the vast majority of broker dealers, who do not hold customer funds or often do not do business with the general public, the increased scrutiny and increased costs have resulted in undue hardship for minimal substantiated value. While ACI does not have any ability to mitigate the audit requirement for our broker dealer clients, we have spent a considerable amount of time and effort to assist with alleviating the obligations of the broker dealer during this annual process. Our recent effort to convert the fiscal year end away from December 31st has been very successful. Auditors are generally less busy during the off-calendar year-end, which has often resulted in broker dealers receiving a higher quality audit at a lower cost. We have actively communicated with our contacts at FINRA and have repeatedly been successful in facilitating our goal of ensuring our broker dealer clients comply with their regulatory requirements in the most time efficient and cost effective manner possible. If you would like to learn more about how ACI can help your firm with this process, please contact Jay Gettenberg at (212) 668-8700, extension 25 or email us at info@acisecure.com. Capital Acquisition Brokers (“CABS”) were created as a new FINRA Membership option after a long-standing battle in the industry to lessen the restrictions on limited purpose Broker Dealers. You can apply to be a CAB member at the onset of your new member application (assuming you meet the criteria per the rule) or you can apply to change your existing membership agreement. effecting securities transactions solely in connection with the transfer of ownership and control of a privately-held company to a buyer that will actively operate the company, in accordance with the terms and conditions of an SEC rule, release, interpretation, or “no-action” letter that permits a person to engage in such activities without having to register as a broker or dealer. A few of the benefits of being a CAB member, include, but are not limited to, being relieved of the obligations to conduct an annual compliance meeting, obtaining an annual written CEO certification on the effectiveness of the firm’s compliance program, establishing and maintaining a business continuity plan (“BCP”) and having fidelity bond coverage. CABs must still implement a written anti-money laundering (“AML”) program but they may conduct the independent testing for AML compliance every two years (instead of annually). While the new CAB framework appears to be de-regulating the industry and adding a more risk based approach to things, it is not clear how many firms will benefit (other than very limited private placement firms). It is hard to gauge who will be eager to jump on this bandwagon due to the limitations on who they can market their investments to. 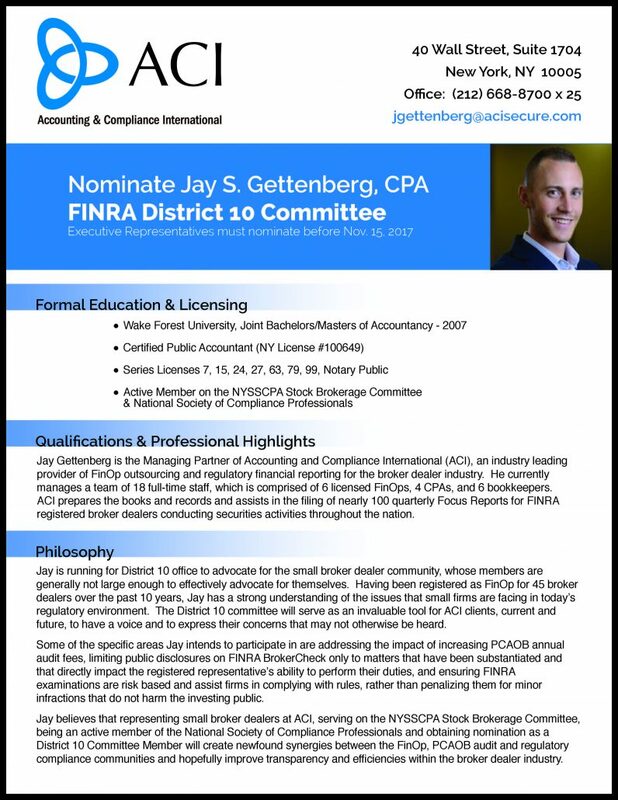 If you would like to learn more about how the CAB rules impact your small broker dealer from ACI’s perspective, please contact Jay Gettenberg at (212) 668-8700, extension 25 or use our web contact form. April is World Autism Awareness Month and we at ACI were proud participants of “Light It Up Blue”. This campaign was started to increase understanding and acceptance of people with autism. Thousands of landmarks, homes and businesses in more than 150 countries were lit blue on Sunday, April 2, 2017. Iconic landmarks that participated, include The White House, the Empire State Building, Christ the Redeemer statue in Brazil, the Great Pyramid of Giza in Egypt, Macau Tower in China and Niagara Falls. We are honored to share that our very own Elizabeth Attanasio was invited to ring the closing Bell at the NASDAQ on April 6, 2017 as a representative of Autism Speaks. Ms. Attanasio, a Chairperson for her local Autism Speaks Committee, is very involved in advocating for the cause and was honored with this invite due to her endless philanthropy efforts with this organization. If you would like to learn more about Autism Speaks or find out how your business can become more involved, please visit www.autismspeaks.org or contact Ms. Attanasio directly EAttanasio@acisecure.com.